It was six years ago in March when MusicPlayers.com launched, and the first guitar to earn our WIHO award back then was the recently introduced Carvin CT6 California Carved Top electric guitar. The CT6 was (and still is) a beautiful dual-cutaway, solid-body guitar with set-neck construction and a flamed maple top that packed a lot of value in a premium, made-to-order instrument. Six years later, we decided to investigate how this guitar has changed for better or worse, and we are happy to report that a guitar we really enjoyed then has gotten even better today. While the CT6 remains a popular choice for the 22-fret crowd, we were thrilled when this past year Carvin introduced the CT624, a 24-fret version of the guitar. Improved painting techniques as well as a continued evolution of the company’s custom pickups took a guitar that was already excellent and elevated it to an even higher quality level: this is a custom guitar that rivals anything the pricier boutique builders have to offer, and everyone who has spent time with it in our studio has bestowed nothing but praise upon it. With remarks like “I wouldn’t change those pickups,” “that will cut so nicely through any rock mix,” and even “That-other-brand killer” (you figure it out), what follows here should be nothing of a surprise. 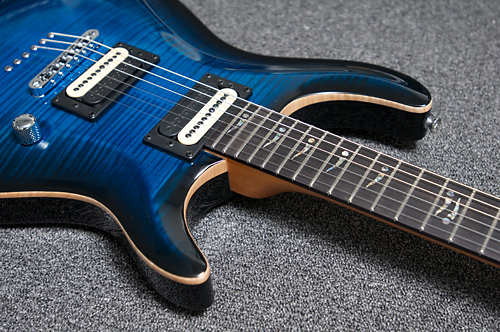 We expected to receive a very nice guitar, but came away extremely impressed by a superb guitar. Congratulations, Carvin, as you’ve outdone yourself with this one. Carvin guitars are sold direct, custom ordered via the company’s website. If you haven’t had a chance to play one for yourself (you won’t find them at your local guitar shop unless you live near one of their few California retail shops), you’ll just have to take our word for it that the photos online and in the printed catalogs do not do the instruments justice. 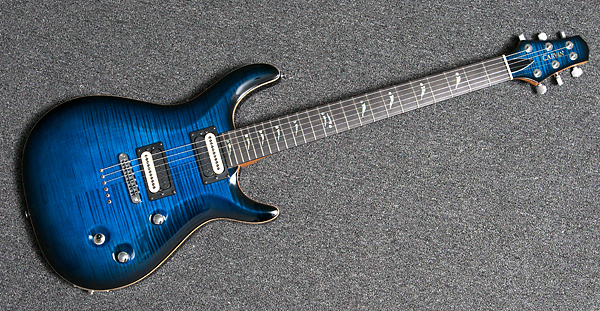 We custom ordered our CT624 (we purchased this instrument as there’s no typical “loaner” model available) with a deep blue flamed maple top utilizing the company’s triple-stained paint technique, fading to black burst edges, natural wood binding, and a black back with matching headstock. Just like some people revel in that “new car smell,” we all experienced that same feeling of euphoria upon opening the included hard case, which revealed that fantastic new guitar finish smell. The body wood and set neck were both Mahogany, and the neck was spec’ed with a clear Satin finish. The neck was topped with a 24-fret ebony fingerboard and medium-jumbo, stainless steel frets. Custom signature inlays adorned the fretboard, which featured a standard 12” radius. We also specified a Graph Tech ivory TUSQ nut, and Sperzel locking tuners were standard issue. Elixir 1046E strings (.010) came standard. In order to be most similar to other commonly ordered configurations, we stuck to the standard pickup configuration: a Carvin C22B humbucker in the bridge and C22J humbucker in the neck. Our guitar featured Carvin’s standard, M-style Tune-O-Matic bridge with string thru-body construction (optional bridges include Floyd Rose and Wilkinson tremolos). Controls on the guitar include a three-way pickup selector (Bridge, Bridge + Neck, Neck), Volume, and Tone. 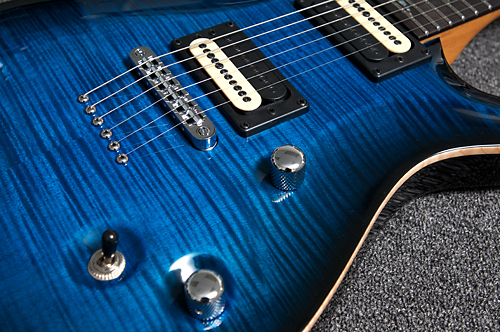 The push/pull Tone knob splits the humbuckers when pulled into the Up position for a range of single-coil tones. To say the Carvin CT624 played like a dream would almost be an understatement, as this guitar shipped with super-low action, and the Satin neck finish was light to the touch. Rock and metal players will love the speed of this neck (get a 14” radius for even sleeker shreddiness), while blues players will still find big string bends an easy thing thanks to the medium-jumbo frets. Upper fret access was easy thanks to the set neck construction. The guitar was well balanced, and it felt to us like the lines of the double-cutaway body have been subtly smoothed over the years from the original CT6. It was extremely comfortable to play both seated and standing. The pickup selector was positioned perfectly out of the way of aggressive playing, yet still close enough for fast pickup selection, and the Volume and Tone knobs were useful across their entire ranges. The guitar’s weight, at 8.25 pounds, is on the lower side for similar guitars, and this, combined with the body proportions, made for extended-play comfort comparable to a PRS Custom 24 guitar. We knew we were in for a treat when we first played the CT624 acoustically and were rewarded with rich, unplugged volume, and we could feel the guitar resonate in our hands. Once we plugged the CT624 into our beloved ENGL Powerball II (a fantastic sounding and musically diverse 6L6-based amp), though, the fun really began. Soloing through one of the high-gain channels on our ENGL delivered serious boutique tone. The neck pickup really sang a fantastic, flutey tone with excellent sustain. Whether we were going for a tone ranging from Carlos Santana to Eric Johnson to John Petrucci, the C22J delivered on all fronts. The bridge position C22B is a medium-output pickup that has definitely come a long way since its introduction. Whatever tweaks have been made over the past six years really improved things, because the complaints we previously had have all but disappeared on the CT624. We’re big sticklers for clean sounding pickups that can drive high-gain tube amps. Loving the complex chord voicings commonly used in progressive rock and prog metal, we were thrilled to hear the CT624 deliver the full definition of our chords, even when playing through extremely high gain sounds on our amp. Granted, you need a tube amp capable of delivering that clean note articulation, too, but if either the amp or pickup are lacking, you get the chordal mush commonly heard from lesser guitars and amps. The CT624 has a very quick attack, and shredders will love the immediacy of the response whether soloing or playing tight rhythm progressions. We suspect the set neck construction and ebony fretboard contributed to the bright tone and snappy response from this guitar, and that character enabled the guitar to cut nicely through a dense arrangement of instruments when playing live. Sustain was excellent. We weren’t big fans of Carvin pickups in the past — favoring the tone of other aforementioned pickups for our personal tastes. Thus, when we ordered the CT624, we suspected that we would enjoy the guitar but feel only so-so about the tone. No problem — we could just swap out the pickups when the review was finished. However, this guitar really surpassed our expectations significantly. The tone was truly fantastic in all positions, both full humbucking and with split coil sounds. At least three of our senior editors (as well as junior staff members) were equally impressed by the tone, and the overall evolution of the CT series guitars. We don’t intend to mess with these pickups at all. In this guitar, they’re a winning combination. Why can’t all guitar companies include simple, product-specific documentation with their instruments? 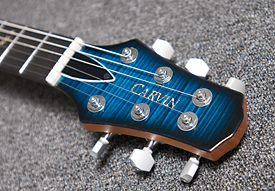 Carvin includes just a single printed page, yet it covers virtually all the details you want to know about, including changing strings with the locking tuners, adjusting the truss rod, adjusting the intonation, etc. What was missing? A reminder that we could split the coils! We missed that fine detail entirely for a while. The Carvin CT624 as we configured it sells for $1,648 plus shipping (an options discount at time of purchase reduced our cost by $100 to $1,548). This is a great price for any professional-level guitar in this style, and the fact that it is so highly customizable (finish, body and neck woods, fretboard radius and materials, bridge, pickups, etc.) makes it a bargain compared to some other similar guitars from the big-name competitors. It’s actually $900 less expensive than its most direct competitor, and those guitars don’t include any custom options. Look at other boutique builders for similar custom instruments and the price gap widens further. With build times typically in the 5-8 week range, plus a money-back guaranty if you don’t like the instrument, Carvin certainly has a leg up over many of its competitors, who sometimes have months of lead time to obtain their custom creations. Keep up the good work, Carvin! OVERALL RATING =3.9, which earns it a WIHO Award! Want to check out some other fantastic guitars?